“Ritual” has become something of a buzzword in black and death metal these days. It’s difficult to imbue a real sense of metaphysical connection into music that often uses offerings (whether to Satan, or some Lovecraftian entity). Enter Genocide Shrines. In the realm of abyssic, cavernous death metal, Genocide Shrines invoke and subvert scripture to create a truly blasphemic offering of sonic force. This record owes a great debt to the Incantation school of death metal, and it checks all of the requisite boxes – a smattering of blastbeats, downtuned guitars, and vocals that scrape the bottom of the deepest trenches. But Genocide Shrines are somehow more than the sum of their parts. I attribute this primarily to their ideology. It’s a strange thing to discuss “ideology” in the context of metal. Too often it stems either from surface-level iterations of Satanism or Lovecraftian fantasy. Genocide Shrines avoid this pitfall by evoking the unlikely source material of Hindu mythology – a nod to their Sri Lankan heritage as well as a promise to deconstruct the altars upon which their country was built. It’s a bold move, made bolder the the framing of the album in two parts, segmented and bookended by three “Pillars”, short acoustic pieces that serve as purifying interludes. The rest of the record, however, rages with a force and purpose that’s admirable in how laser-focused it is on this particular brand of blasphemy. There’s a tendency among chug-heavy death metal bands to mindlessly hammer away at their chords and/or kits to produce the classic “subterranean” sound, where individual notes get lost within the chaotic maelstrom of the music itself. Thankfully, Genocide Shrines avoid this pitfall via well-placed rhythmic diversions – “Subterranean Katacomb, Termination Temple (Henotheistic Primal Demiurge)” is particularly notable in this regard, with double-bass triplets that break up the segments of downtuned bludgeoning, and the slow-rolling introduction to “Hurl Burning Spears To Exhume the Raavanic Throne Of Sivvhela Retaliation” is nothing short of incredible. Instead of simply diving into the chaos, the band eases up, and settles for a more pensive opening that makes the opening riff all the more powerful. It’s this respect for the ebb and flow of their music that makes Genocide Shrines stand out among their peers. Where many would be content to plumb the depths, this band recognizes that for their message to carry weight, it requires an equally vitriolic musical component. It’s evident that just as much effort went into crafting the intricacies of these songs as went into the pseudo-mythological ideology that the band endorses. 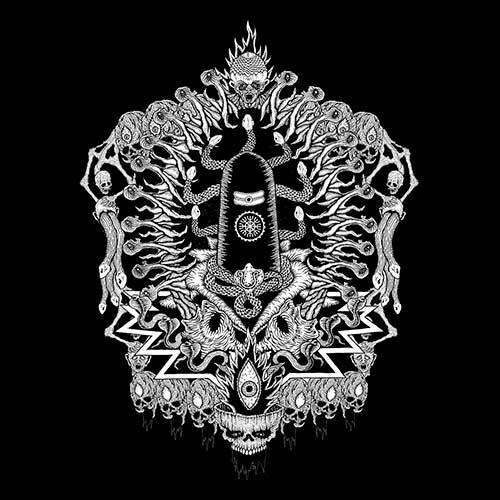 Having grown up as a Hindu, this record had a special sort of effect on me – I’m unsure of whether it’s because of my familiarity with the belief systems in play, or because of the sheer force of the music, but I find myself truly blown away by Genocide Shrines. It’s rare that I identify on a personal level with this type of music (Satanism is less my forte than simple negative emotion), but even after several listens, I found myself unable to quit listening. It’s one of the few that really caused me to crave more. From the clear callout to Conqueror with the title of “Gas.Mask.Gauthama (And Other Raavanic Resurrections)” to the strange tabla and flute on the closing Pillar, there’s more than enough to keep even the most discerning listener engaged. Genocide Shrines balance their music and blasphemy perfectly, where other similar efforts fail by placing the latter on a pedestal. Because of the quality of songcraft on display, this record has a great deal of sticking power, and not just because of the impressively wordy song titles. Each track has several segments that worm their way into the mind, jumping between the (thankfully) high pitched riff of “Hurl Burning Spears…” to the fifty-ton boulders that drop onto your ears in the midsection of “Ethnoheretical Padmavyuha Consecration.” This is a truly high-quality death metal record, one that would be well worth anyone’s time, provided that they have no problem with the total and unavoidable desecration of the six holy Shastras.